Opening: There are times when I worry about what might happen next and what happened before. The world can be a noisy place for young minds, filled with worries, fears and doubts. Young readers will identify with the child in the book: “The thoughts in my head are like rushing water and I feel like a boat with no anchor…being carried away.” As these feelings get overwhelming, the child takes a moment to breathe, and in a practice of mindfulness, finds a space of peace and calm. Children can learn how to manage their emotions, make good choices and balance their busy lives by learning to be mindful. Express emotions through speech. Find empathy through imagination. Wonder at the beauty of the natural world. Given the landscape of today’s fast-paced technologically stimulated world, I Am Peace is a gentle and loving reminder for kids to appreciate living in the moment, calm their emotions, be patient and kind with themselves and others, and respect the simplicity of nature. The creative team of I Am Peace, Susan Verde and Peter H. Reynolds, have once again collaborated on an engaging and interactive picture book — a treasure for children to grow up with. Verde has penned an original and joyful story of self-discovery. The lyrical text is written with simplicity giving readers time to grasp the importance the power of now. Reynolds’ illustration have his signature whimsical appeal. Just look at the cool book cover. His use of soothing watercolors gracefully captures the peaceful poses as the child meditates, watches clouds, and shares seeds of kindness where ever he/she goes. l Am Peace is a companion book to I Am Yoga, written and illustrated by this dynamic duo. I am drawn to this beautiful story because of the benefits of teaching mindfulness to young children. If children learn a mindful practice in their developing years, it becomes a natural part of who they are. 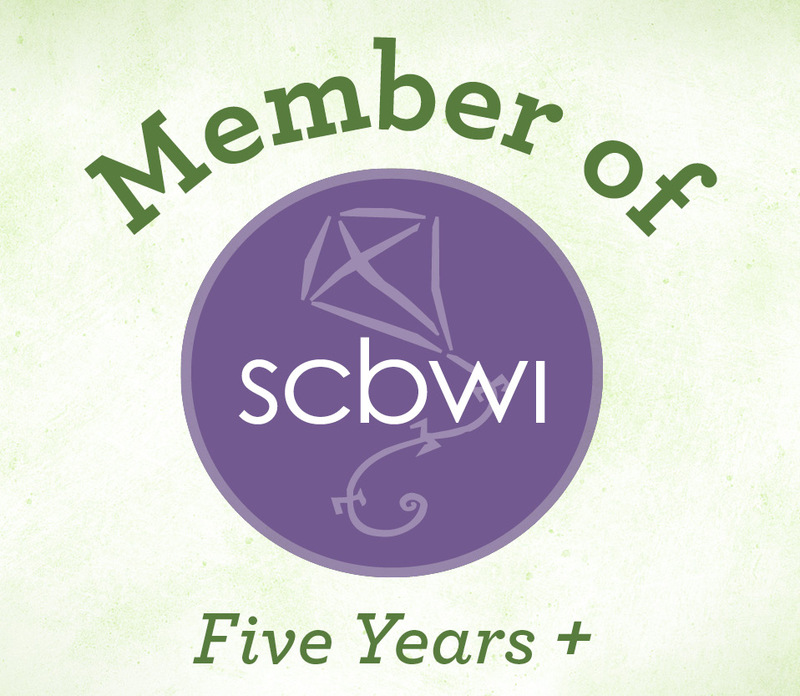 It gives them tools to bring balance into their busy lives, to engage mindfully, and develop a sense of well-being. Mindfulness will benefit children for a lifetime and help them change their world. 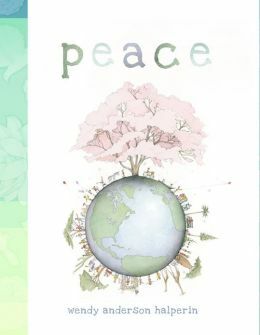 I Am Peace is a timely book for children in light of the United Nation’s annual September 21 designation of International Day of Peace. Resources: There is an Author’s Note for parents and teachers and a Guided Meditation at the end of the book that will echo the sentiments of the narrator. It is a beautiful introduction to peaceful meditation for children. *Abrams provided me with an advanced reading copy (ARC) of this book in exchange for a fair and honest review. Synopsis: Few Pakistani families can afford to pay for the children’s education. Others only paid for their sons’ educations. Mala grew up in a world where women were supposed to be quiet. Many parents believed their daughters should cook and keep house. Mala’s parents believed that girls deserved the same education as boys. She studied hard, could speak and write her native Pashto language and fluent English and Urdu. The Taliban leaders were against educating girls, intimidated school leaders, and ordered her father to close his school. But Malala Yousafzai refused to be silent in Swat Valley. She defied the Taliban’s rules. She spoke out for education for every girl. When schools closed she wrote a blog for the BBC and gave interviews. She was almost killed for her beliefs. This powerful true story of how one brave girl named Malala changed the world proves that one person really can make a difference. Rebecca Langston-George powerfully communicates the story of Mala Yousafzai through her careful choice of words so that students are not frightened by her story, but are inspired. Malala is the voice of the many silenced girls who want to attend school. She is a selfless role model for girls everywhere. I especially like how the book begins on a positive note with Mala receiving the Nobel Peace Prize and with excerpts from her speech. Readers will immediately feel the power in her words and her commitment to be the voice for equal education. The setting is very realistic with an emphasis on Pakistani culture, community, family life, and traditions. It gives readers a strong sense of what it is like to live in a country where the rights of women and girls are suppressed. It is a story that needs to be told and can be used as a springboard for students to talk about the inequalities for girls and women worldwide. Hopefully, readers will appreciate their education and not take it for granted. Janna Bock’s beautiful illustrations make this story soar. She captures the love of a supportive family, the beauty of the Swat Valley with its lush valleys and beautiful waterfalls, the joy of Mala and the other girls studying together at school, the growing fear as the Taliban force girls and women to wear garments to cover their entire bodies and faces, and the danger everywhere. 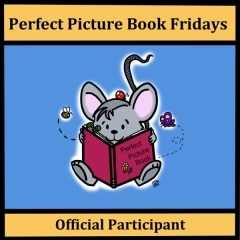 Bock’s illustrations made this book an emotional story that is filled with courage and hope. Resources: This book belongs in every school library. It will spark many lively discussions among students about the education of all students globally. For older students there is a page, “More About Malala’s Story” at the end of the book. It is the perfect book the United Nation’s International Day of the Girl, Oct. 11, 2016. This year’s theme is: Girls’ Progress = Goals’ Progress: A Global Girl Data Movement. It’s just not a day, but a movement where girls get involved. Also check out Day of the Girl – US. And, today the 2016 Nobel Peace Prize will be announced. Book Jacket Synopsis: Summer is here, and Alya, an Israeli Palestinian girl, and Yuval, and Israeli Jewish boy, are off to Peace Camp. They are excited, but their excitement is mixed with apprehension. The area in which they live has been fought over by Palestinians and Jews for a hundred years. What will campers from the “other side” be like? the children wonder. At camp, Alya, Yuval, and the other campers enjoy two weeks of fun in close contact with one another. They participate in sports, create arts and crafts projects, and go on field trips. The children begin to understand what their homeland means to both sides. They learn not to be afraid and to respect one another. 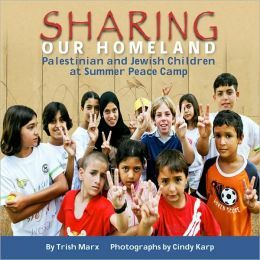 Trish Marx has written a compelling and thought-provoking book for youth about a Peace Camp for children in one of the most complex parts of the world. It is heartwarming to know that there are both Jews and Muslims living in Israel who would like a peaceful coexistence. The book focuses on a Muslim girl, Alya, and a Jewish boy,Yuval, who happen to live in neighboring settlements and probably would never meet, except through camp. Readers are introduced to their families, learn a little about their daily lives, occupations, culture and traditions. The author gives a brief history about the Middle East and the context for the conflict in the region. As she does so, she explains how Alya and Yuval live in the midst of this ongoing conflict and the impact on their lives. The goal of Givat Haviva’s Menashe Summer Peace Camp is to build “bridges and understanding among the campers.” It reaches out to children with the hopes of creating a foundation for peace, tolerance and respect for each other. Cindy Karp’s vivid and colorful photographs are filled with laughter and chronicle the activity of the campers. The campers’ days are filled with swimming, water slides, a day at the beach, arts and crafts projects, climbing, and games. There are field trips to a kibbutz (Jewish settlement) and an Arab village where they learn to bake challah bread and taboon, a round flatbread. There is a sleepover the last night. Readers will gain insight into the Israeli-Palestinian conflict and feel hope that solutions may come with younger generations. I highly recommend this book and hope that it has a home in every school library. Resources: The author provides further reading, websites of interest, and a glossary at the end. You may visit Trish Marx at her Lee & Low website. Opening: For many years the house next to Sameer’s had stood empty. “What a pity!” his mother often said. The family who lived there had gone away during the troubles, because they were different from most of the people in the village. But now, the long war was over, and they were coming back. Synopsis: Sameer leans on an old stone wall that divides the property between two families. Above him an ancient olive tree grows on the other side of the wall, but the best olives fall on his family’s property. He eagerly watches the family move back into their home and hopes that they have a boy with whom he can play. But Muna doesn’t want to play with Sameer, or share her family’s olives. One night during a storm, lightning strikes the olive tree and it crashes to the ground. Even the stone wall is broken. Will the two children find a way to resolve their differences? Elsa Marston’s The Olive Tree is a richly textured and realistic story about two Lebanese children who struggle to get along after a war, learn to share, and find friendship through adversity. The narrative is simple and lyrical. There is tension between Sameer and Muna, who are from two different families with different backgrounds. When their beloved olive tree is struck by lightning, they work silently together to clear the broken branches from their yards. They move beyond their anger, reconcile and heal. This book is a reminder that our actions toward peace and reconciliation are powerful and unifying. They do make an important difference in the lives of those around us. Children will gain a glimpse into a contemporary Lebanon and its culture. Marston was in Lebanon at the outbreak of the war and after it was over. She was moved to write this hopeful middle eastern story. This healing multicultural book belongs in school libraries as it will encourage many interesting discussions among students. Claire Ewart’s beautiful illustrations are warm and colorful watercolors that draw the reader into the story from the first page. Her artwork is expressive and supports the emotion and tension in the story. 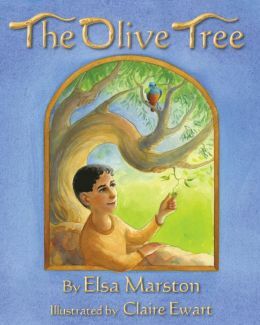 Resources: Visit Elsa Marston’s website to learn more about The Olive Tree. She has included some background information about Lebanon, the culture, the civil war and discussion questions for the classroom. I especially like her role-playing suggestions. Book Jacket Synopsis: Arun Gandhi lives with his family in Grandfather Gandhi’s village, where the days are thick and hot. Silence fills the air–but peace feels far away for young Arun. When an older boy pushes him on the soccer field, Arun’s anger fills him in a way that surely a true Gandhi could never imagine. Can Arun ever live up to the Mahatma? Will he ever make his grandfather proud? Why I like this book: It is a true story that Arun Gandhi worked on for 10 years with Bethany Hegedus about his own intimate relationship with his grandfather, Mahatma Gandhi. It is an endearing story about a boy’s memories of his grandfather and his mixed emotions about living up to the Gandhi name. The narrative is beautiful and told in first person. Living in Bapuji’s village is hard for Arun. The food is simple and bland. The day begins at 4 a.m. with prayer and is followed by chores and lessons. This is a demanding life for an energetic 12-year-old boy who misses John Wayne movies, electricity and real soccer games with friends. Most of all he misses having access to his grandfather, who is surrounded by aides. He is teased by the other kids and erupts in anger. But there are touching moments when Gandhi checks on his grandson, listens to his frustrations, wipes his tears and talks about how he handles his own anger. Gandhi tells Arun how he can use his anger to make change. “We can all work to use our anger, instead of letting it use us.” This is a picture-book biography that stands out because it is a glimpse of a grandson’s personal account of his relationship with his famous grandfather. Evan Turk’s illustrations are stunning, bold and expressive. He uses water colors and mixed media collages with paper, cotton, cloth, yarn and tin foil. I highly recommend this unique story. 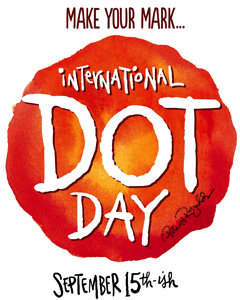 Resources: Use this book to celebrate International Day of Peace on September 21. Talk about what anger feels like. Draw pictures of your anger. List ways that you can channel or turn anger and negative feeling into positive action, as Gandhi suggests. Talk about non-violence and peace. Visit Arun Gandhi at his website where you will find a wealth of information. Arun Gandhi, born in 1934, is the fifth grandson of Mahatma Gandhi. As a journalist for more than thirty years for the India Times, Arun now writes a blog for the Washington Post. He serves as president of the Gandhi Worldwide Education Institute and travels the world speaking to governmental leaders, as well as university and high school students about the practices of peace and non-violence. 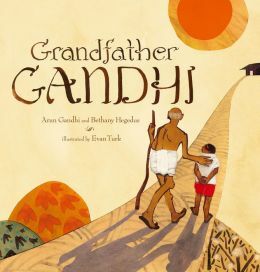 Bethany Hegedus is the author of Between Us Baxters and Truth with a Capital T. Grandfather Gandhi is her debut picture book. She heard Arun Gandhi in October 2001, a month after 9/11., after he spoke in New York City’s Town Hall about his relationship with his grandfather. A story he shared “hit her hard” and she contacted Arun and asked him to work with her on a children’s book. Visit Bethany Hegedus at her website. Synopsis (Book Jacket): This is a true account of two brave children caught in the Holocaust and a young Japanese woman’s determination to tell their story. In March 2000, a suitcase arrived at a children’s Holocaust education center in Tokyo, Japan. On the outside, in white paint were these words” Hana Brady, May 16, 1931, and Waisenkind–the German word for orphan. Children who saw the suitcase on display were full of questions. Who was Hana Brady? What happened to her? They wanted Fumiko Ishioka, the center’s curator, to find the answers. In a suspenseful journey, Fumiko searches for clues across Europe and North America. The mystery of the suitcase takes her back through seventy years, to a young Hana and her family, whose happy life in a small Czech town was turned upside down by the invasion of the Nazis. What I like this book: Kudos to Karen Levine who performed the original Canadian radio broadcast about Hana, George and the children of Tokyo, which resulted in this book. This was a tragic story about a Jewish girl killed in Auschwitz. It was also a heartwarming story about the determination of a woman, Fumiko Ishioka, the director of the Tokyo Holocaust Education Center, who wanted to teach the children of Japan about the Holocaust and the importance of building peace. Since Japan was an ally of Nazi Germany during World War II, the children of Japan knew little about the atrocities that occurred. Once the suitcase arrived with Hana Brady’s name and birth date, the children asked questions. Fumiko embarked upon a journey that linked three continents together. She found Hana’s brother in Canada and invited him to visit with the children of Tokyo, and see Hana’s long-lost suitcase. He told the students about Hana and their life before the Holocaust and about life in prison camps . Although difficult for George Brady, he discovered that in the end he was honoring Hana’s wish to become a teacher. In her death, she was teaching millions of children worldwide about what happened to one-and-a-half million Jewish children. The exhibit traveled all over Japan. 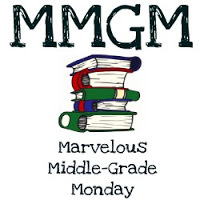 Resources: This book is a great teaching tool for grades 5 to 8. There is back matter in the book. 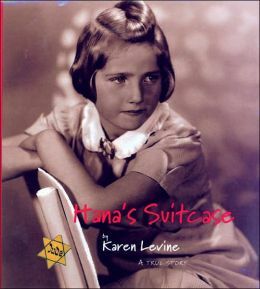 A 90-minute DVD about Hana’s Suitcase can be found in libraries. It chronicles the events from Fumiko receiving the suitcase, her research, the Japanese children’s involvement, to George’s visit to Tokyo and his interaction with the students. I highly recommend this book for classrooms and homeschoolers. You may want to check out the Brady Family Website which if full of fascinating information and Karen Levine’s original radio interview. For parents and teachers wishing to help children focus on the uniqueness and diversity of our global community, I have compiled a list of some of my favorite picture books that fit this theme for children ages 4 to 9 years. 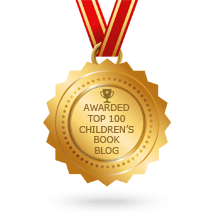 They are all excellent selections for parents and teachers to use with children at home and at school. Synopsis: Halperin’s message is very clear from the start. For there to be peace in the world…you must have peace in your heart. Her lyrical style encourages children to question “how do we bring peace to our world.” There must be peace in nations…in cities…in neighborhoods…in schools…in homes…and in hearts. The text includes quotes from famous peace makers. Her artwork is simply stunning pencil and watercolor, and intricately detailed. The illustrations in the beginning show every day problems in all cultures. Once you reach the middle, the text and illustrations in the book reverse and show how the world could be if we have peace in our hearts. Such a beautiful contrast. This book will lead to many interesting discussions. It is a gem! Synopsis: Hamanaka reveals through soft verse that despite our physical differences, children everywhere are lovable and all the same. The book opens with “Children come in all the colors of the earth…” She creatively uses the colors of the earth to depict how closely we are all related, even through nature. Children come with hair like lambs and hair that flows in water. They come in all colors of love of their families, and in cinnamon, wheat and caramel and chocolate and honey bees. Their vibrancy and innocence has a valuable impact on our land, and unite us as one. Her book leaves one hopeful for our future. I also appreciate that Hamanaka carefully includes children with special needs in her lush illustrations. Her book is inspired by her own two children’s multi-ethnic heritage. Synopsis: Fox’s book focuses on the differences between people around our planet, and the similarities that unite us like love, pain, and joy. It is a beautiful celebration of all human life. Her message is simple — there are children just like you all over the world living in different homes, attending different schools, speaking different languages, and living lives that are culturally different. But no matter where they are, they all smile, laugh, cry and love. Staub’s illustrations are colorful, folk art–style oil paintings and give the book a warm feeling. This a story children will easily relate to. Synopsis: Radunsky opens the book with children and adults saying “Peace” in a variety of languages. Children at the Ambrit international School in Rome were asked to comment on peace using their five senses: what it smells, sounds, tastes, looks and feels like. Their answers are simple and in many ways wise. 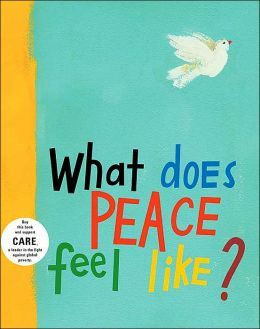 For example, “What does peace sound like?” The children respond, “like a silent day.” The book will encourage children to share their own thoughts and visions of peace. The illustrations are vibrant and colorful and compliment the story. Radunsky ends the book with “peace” in approximately 190 different languages. Synopsis: Life in the garden was alive with activity. Gloria, a tall and wise sunflower, sprung up earlier in the season near a pepper tree. She was once a black and white seed in one of the bird feeders. She was dropped by a bird to the ground where she planted herself and grew. Two smaller sunflowers, Sunny and Solita, grew beside Gloria. Their day was peaceful until a hawk swooped down to the feeders and disturbed the tranquility in the garden. The birds flew off. Solita and Sunny were frightened and shouted at the hawk. But, Gloria reminded them “We are sunflowers, golden and radiant.” “Our job is to be loving and peaceful wherever we stand.” Peace returned to the garden, but later that afternoon a thunderstorm darkened the skies and threatened the strength and stability of the sunflowers. Once again Sunny and Solita held on by their roots afraid they might tumble. Gloria reached for their stalks and pulled them close. Their resiliency was tested in the face of a big storm. Why I like this book: Janet Lucy has created an inspiring book for children with many gentle life lessons about staying centered when turbulence is swirling around you, being who you are supposed to be, living in the moment, being present with those we love and being thankful. These are all concepts children will grasp. There is so much depth to this story and I had to be careful not to give it away. With spring around the corner, it is also a story about life cycles, death, and transformation. Colleen McCarthy-Evans’s watercolor illustrations are exquisite and perfect for the story. 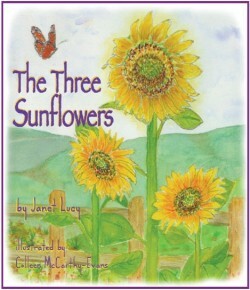 Resources: Sunflowers are an international symbol of Peace. Lucy urges children to plant seeds of peace in their gardens. You only need to visit The Three Sunflowers website to find wonderful resources, activities and a teaching guide to share with children. I was intrigued with how many virtues are included in this story, all great topics for discussion. Synopsis: Nelson was nine years old when his father passed. His mother sent him to live with a powerful tribal chief, where he could continue his studies. He learned stories from the elders about old Africa, where people lived peacefully, the land was rich and fertile and people raised crops. The European settlers arrived and everything changed. Nelson attended school in Johannesburg where he became a lawyer who defended the poor. The government began to divide the people into three groups — African, Indian and European. The divisions were deep with Europeans in power, and apartheid was born. 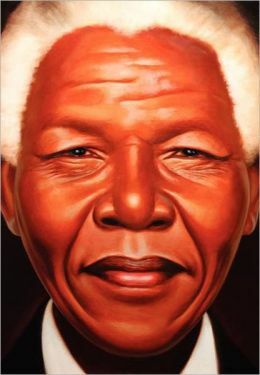 Nelson wanted to win back South Africa for everyone and organized rallies to speak out and fight apartheid. He became a leader among his people, but an enemy to the South African government. He was arrested and put in prison for over 27 years. South Africa erupted into violence and the world put pressure on the government. When Nelson was released from prison in 1990, he said “We must forget our terrible past and build a better future for South Africa. Let us continue to fight for justice and walk the last mile to freedom.” All South Africans had won their right to vote. And, they elected Nelson Mandela their president. What I like about this book: The first thing you notice is that there is no title on the book. Kadir Nelson’s larger than life oil painting shows power, integrity, determination and strength. It is mesmerizing. The illustrations throughout the book are exquisite and capture the emotion of this very important time in South Africa’s history. Because Nelson Mandela was a man of few words, the author tells the story very simply and powerfully in verse. Kadir Nelson says: “My work is all about healing and giving people a sense of hope and nobility. I want to show the strength and integrity of the human being and the human spirit.” And, that he does. You can visit Kadir at his website. Resources: There are pages of historical information at the end of the book, with suggested readings. For teaching resources and activities go to Mandela at 90. 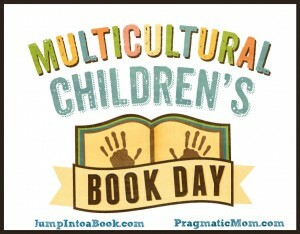 I want to share children’s books that celebrate our uniqueness and diversity. The books I’ve selected are gems that children will love, easily grasp their meaning and want to read again. 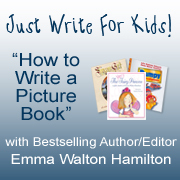 All three books are great books for home and in the classroom. 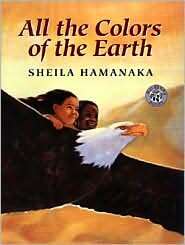 All the Colors of the Earth, is written and beautifully illustrated by Sheila Hamanaka. She reveals through soft verse that despite our physical differences, children everywhere are lovable and all the same. The book opens with “Children come in all the colors of the earth…” Hamanaka creatively uses the colors of the earth to depict how closely we are all related, even through nature. Children come with hair like lambs and hair that flows in water. They come in all colors of love of their families, and in cinnamon, wheat and caramel and chocolate and honey bees. Their vibrancy and innocence has a valuable impact on our land, and unite us as one. Her book leaves one hopeful for our future. I also appreciate that Hamanaka carefully includes children with special needs in her illustrations. Her book is inspired by her own two children’s multi-ethnic heritage. 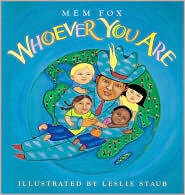 Whoever You Are, is written by Mem Fox and richly illustrated by Leslie Staub. Fox’s book focuses on the differences between people around our planet, and the similarities that unite us, such as love, pain and joy. It is a beautiful celebration of all human life. Her message is simple –there are children just like you all over the world living in different homes, attending different schools, speaking different languages, and living lives that are culturally different. But no matter where they are, they all smile, laugh, cry and love. Such a powerful story. The Colors of Us, is written and boldly illustrated by Karen Katz. Lena’s mother is an artist and she very creatively explores and teaches her daughter the many differences in the color of their friend’s skin through her paint palate. Lena describes her mother as the color of French toast. Her mother shows Lena how to mix the right paint combinations that will match her own skin. Lena is a shade of brown, so her mother takes her for a walk to show her the beautiful colors of skin. She finds friends who are the colors of creamy peanut butter, honey, reddish-brown, butterscotch, golden brown like pizza crust, bronze and amber. Lena is very excited with all she observes and begins to see each friend as a beautiful shade of color. Lena ends the day with all of her paints and begins to mix the colors so she can paint a picture of all her friends — “the colors of us.” Great read!